Please note: due to high demand for Green Books, orders placed after February 15, 2019 will be delivered at the end of May. To remain compliant with Ontario’s workplace posting requirements, ensure you have the older version of the Green Book posted and proof of purchase of the 2019 Green Book. Ontario businesses must have a copy of The Green Book (Ontario Occupational Health & Safety Act and Regulations) posted in their workplace. This is a requirement put in place by the Ministry of Labour so that workers know about their rights. The Green Book is updated annually and published by OSG Inc. based on legislative and regulatory changes. 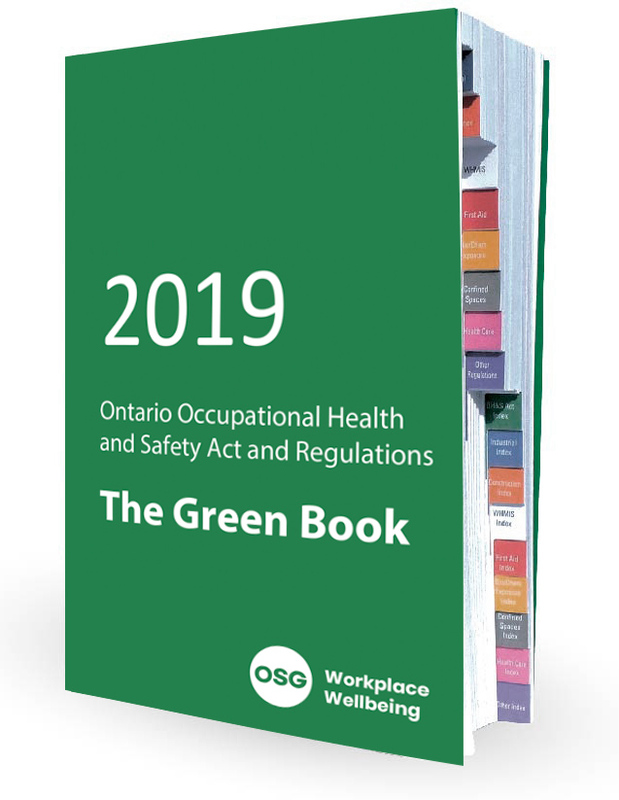 The Green Book contains the complete, current Ontario Occupational Health and Safety Act (OHSA) and also includes the following regulations: confined spaces, construction projects, control of exposure to biological or chemical agents, designated substances, farming operations, first aid requirements, healthcare and residential facilities, industrial establishments, and WHMIS. Note: This book does not include information pertaining to mines. Employers and supervisors must ensure workers are aware of the hazards presented by people, equipment, materials, the environment, and processes. They have the right to be trained on, and to receive information, about dangerous and hazardous substances to which they are exposed, or may be exposed to. The right to participate is best illustrated through worker membership on the JHSC. Workers have the right to ask questions about issues concerning their health and safety, or that of a coworker. Workers have the right to be a part of the process of identifying, assessing, and controlling workplace health and safety hazards. Participation can also be achieved by reporting unsafe conditions to the supervisor or employer. Workers may refuse work where they believe it is likely to endanger themselves or another worker. The Act includes a detailed process for refusing unsafe work, and it explains the employer’s responsibility for responding to work refusals. The Act also provides workers with protection from reprisal, or retaliation, from the employer, should they decided to refuse unsafe work.